Argor Heraeus or Kantonal Bank Argor Haraeus 250 Gram Gold Bullion Bar 999.9 Fine. Each bar contains 99.99% pure investment grade gold bullion. Due to their size and weight, these bars are not sold in a certicard. They are individually sealed in plastic, and sold with a separate certificate issued by Argor Heraeus, confirming the serial number and authenticity of the bar. The top of each bar features the Argor Heraeus logo, followed by the bars's weight, fineness and serial number. 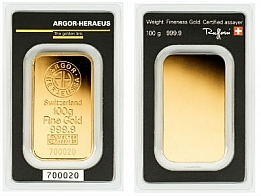 Argor Heraeus gold bars are available in sizes ranging from 1 gram to 1 kilogram, however most individuals looking to buy gold for investment prefer to purchase bars in sizes from 1 ounce to 1 kilogram, due to the lower premiums on the gold bars. 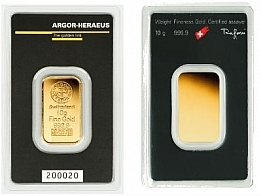 Argor Heraeus also produce precious metals bars in silver, platinum and palladium. 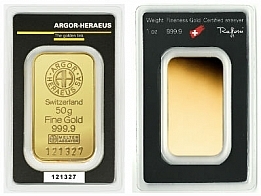 Argor Heraeus manufactures all of the precious metals products sold by UBS and Raiffaisen Bank, in addition to the gold Kinebars manufactured by the Austrian Mint. View today's current gold price. 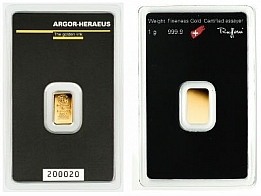 Contact us to sell Argor Heraeus gold bars.